This is the cutest book for the first day of school!! This story is about Pete the Cat going to school and learning where everything is in the school including the lunchroom, the library, and the playground. This would be great for new students (especially kindergartners) to learn what everything looks like if they are new to the school since there are bright illustrations of each room. For example, the lunchroom has cafeteria tables and a lunch line, and the playground has a swing set. 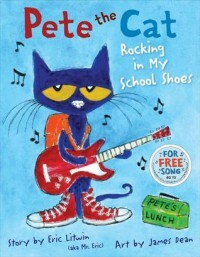 This is also a great book for students who may be a little nervous because even though some things go wrong, Pete the Cat doesn't sweat it. He's rockin in his school shoes and everything is alright.